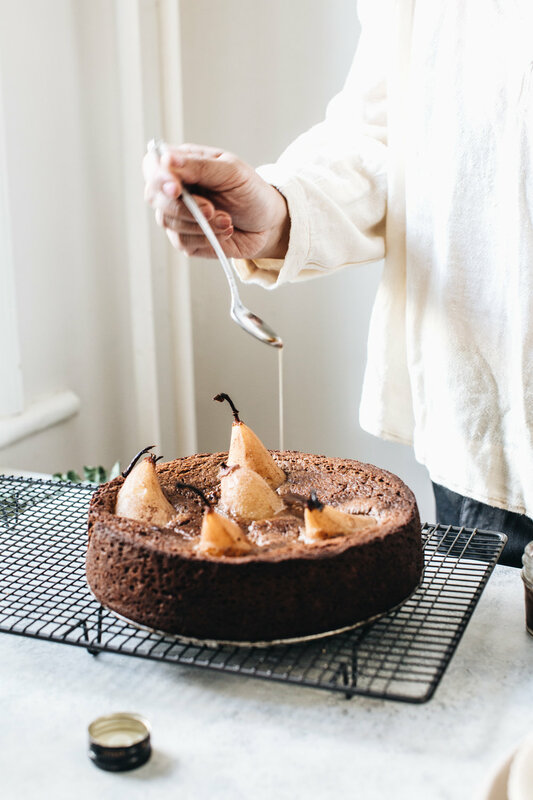 Inspired by sticky date pudding, an Australian and British dessert icon (and a favourite dessert of mine), this sticky date olive oil cake is characterised by its bold flavors. This vegan cake is moist without being gooey or dense, with a delicate and light crumb. 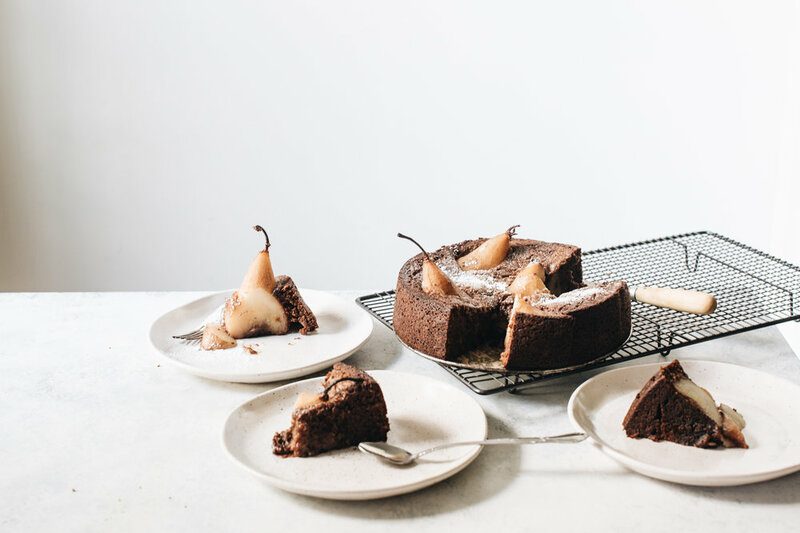 The addition of olive oil delivers an irresistible savoury and ever-so-slight peppery undertone, which pairs wonderfully with the aromatic, chai spiced pears. This cake is dark, light and bright, bursting with intriguing flavors. Serve a slice with vanilla ice cream (vegan if you prefer) topped off with a drizzle of olive oil! Preheat oven to 350˚F (180˚C). Grease and line a 9 inch (22cm) spring form tin. In a medium saucepan (big enough to fit four pears), add the water, sugar, tea bags and place on medium heat. Bring to a gentle boil, and then simmer on low heat until the sugar has melted. While simmering, peel the pears (leave the stems), and slice a ½ inch strip off the bottom so the pears sit flat. Remove the core with a melon baller or small teaspoon and scoop out the pips from the bottom of the pear. Place the pears in the poaching liquid, cover with a lid and poach on gentle rolling heat for 15-20 minutes until a knife easily inserts into the pear. Set the pears aside to cool in the liquid. Discard the tea bags. Place the dates, flaxseeds and almond milk into a medium saucepan and bring to a gentle simmer. Cook for 2-3 minutes until the dates are soft. Place the date mixture into a blender or food processor and blitz until smooth. Add the olive oil and whizz again to combine. Set aside to cool. In a large mixing bowl, add the brown sugar, self-rising flour, baking soda, spice and salt, and whisk to combine and to get rid of any lumps. Add the olive oil date mixture and stir well. Pour the cake batter into the prepared cake tin, smoothing out the top with a spatula. Nestle the pears to stand upright into the batter (the bottom half of the pear should be covered), in a circular formation so the pears are evenly spread out. Bake for 35-40 minutes, until an inserted skewer comes out clean. Set aside to cool for 8-10 minutes. While the pears are baking, bring the pear poaching liquid back to the boil and simmer on high heat until reduced and thick, about 5-6 minutes. While the cake is still warm, brush or spoon the syrup over the cake, allowing the liquid to absorb into the cake before adding more. Keep a little of the syrup aside for serving. To serve, serve slices of the cake with a scoop of ice cream (vegan, if you prefer!) and finish with a tiny drizzle of olive oil over the ice cream. * If you don’t have self-rising flour, make your own by combining 1 cup (150 grams) of all-purpose flour with 1 ½ teaspoons baking powder, ¼ - ½ teaspoon salt and ¼ teaspoon baking soda. **This recipe was developed in conjunction with Lucini Italia Everyday Extra Virgin Olive Oil.